This is a stunning revelation. Features of the upcoming Radeon RX 500 Series Vega architecture have leaked! And the way in which they have been leaked is pretty impressive – the complete information about Radeon RX500 Series Vega architecture have been pulled from the code-base of the Vega teaser website ve.ga. While the rest of the world humbly takes a look at the innocent landing page which shows the countdown of 2 Days, 21 Hours even as we write this post, let’s dive straight into the leaked features! Vega architecture is being touted as AMD’s most advanced and most impressive graphics architecture to date. 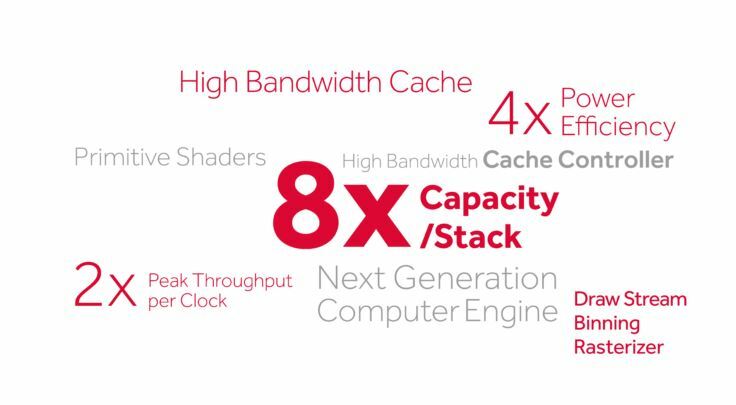 Vega Architecture offers 4x power efficiency, 2x peak throughput/performance per clock, high bandwidth cache, 2x bandwidth per pin and 8x capacity per stack. Not just that, the architecture boasts of 512TB Virtual Address Space, next generation compute engine, next compute unit (NCU) architecture, next generation pixel engine, rapid packed math, draw stream binning rasterizer and primitive shaders. This is enough to paint a solid picture about how advanced Vega architecture is when compared to Polaris. Vega is expected to deliver 4 times the graphics performance as compared to Polaris. What’s interesting is the fact that the Vega will deliver 4x improved performance at the same power as Polaris! This is a huge improvement considering the fact that increasing performance at such a staggering rate without increasing power consumption is no trivial task! This indirectly translates to Vega delivering double the single precision compute at the same power as Polaris. Vega will also deliver double the performance of Polaris for any given clock speed, which gives it the “2X peak throughput/clock” feature. HBM2 comes in stacks of up to 8GB and 256GB/s of bandwidth, offering 8x the capacity per stack as compared to first generation HBM. HBM2 clocks at double the HBM frequency, which translates to 2x bandwidth per pin. AMD will roll out its next generation Vega architecture across Radeon graphics cards very soon. The highest end models are likely to feature HBM2. The mid-range and less expensive cards are likely to feature GDDR5/X memory.